The Measurements, Standards, and Data for Energy Conversion Materials Project provides the underpinning measurement science needed to support the development, production and reliability of materials and devices related to advanced energy sources, renewable energy, energy storage and energy-harvesting. To this end, we develop Standard Reference Materials (SRMs), measurement methodologies, comprehensive data sets, and phase equilibrium data for bulk and thin film materials used for energy conversion applications. Thermoelectric materials enable the interconversion of thermal and electrical energy and are the physical mechanisms for power generation (waste heat recovery) and solid-state refrigeration applications. These diagrams illustrate how a thermoelectric unicouple, comprised of both n- and p-type semiconductors connected electrically in series, can be used for both of these applications. Current economic and environmental issues demand improvements in energy conversion technologies for efficient utilization of energy resources. The United States industrial sector consumes approximately one third of all energy used in the United States, roughly 32 quadrillion Btu (1015 Btu) of energy annually. Between 5-­13 quadrillion Btu/yr of this energy is ultimately lost as waste heat via streams of hot exhaust liquids and gases, as well as through heat conduction, convection, and radiation from manufacturing equipment and processes. To put this in perspective, if 15% of this heat could be effectively captured and converted into electricity, it would be enough to power over 20 million homes per year. Applications using thermoelectric materials, for example, which can interconvert thermal and electrical energy, have demonstrated potential for meeting such needs as waste heat recovery in engines for automotive, aerospace, and military applications, and solid-state refrigeration for consumer products and microelectronics. The widespread use of thermoelectric converters for vehicular waste heat recovery could lead to a 10 % improvement in fuel efficiency, translating to a fuel savings of about $150 per year for every automobile, as well as decreased CO2 emissions. In addition, improved cooling of microelectronic devices would result in greater operational efficiency and reliability of integrated circuit chips, which are the major products of the $120B U.S. semiconductor industry. However, commercially available thermoelectric devices are only about 5% efficient. The Measurements, Standards, and Data for Energy Conversion Materials Project provides the underpinning measurement science needed to support the development, production and reliability of materials and devices related to advanced energy sources, renewable energy, energy storage and energy-harvesting. We develop Standard Reference Materials (SRMs), measurement methodologies, comprehensive data sets, and phase equilibrium data for bulk and thin film thermoelectric materials that enable the reliable inter-laboratory comparison of data and the confirmation of reported high efficiency thermoelectric materials. Materials and device producers require accurate measurements of the electrical and thermal transport properties to optimize and commercialize materials in both bulk and thin film form for use in thermoelectric devices. Our testing capabilities include both commercial and custom developed tools, comprising 1) electrical resistivity, Seebeck coefficient, and thermal conductivity on bulk and thin film materials from 1.8 K to 390 K, 2) AC resistivity as a function of magnetic field angle, 3) temperature dependent Hall effect/carrier concentration/carrier mobility (superconducting magnet up to 9 T), 4) heat capacity under magnetic field, 5) high temperature (300 K and 1000 K) electrical properties, e.g., electrical resistivity and Seebeck coefficient, in 2- and 4-probe arrangement, and 6) composition-spread thin film synthesis via sputtering or pulsed-laser deposition. We have also developed tools for high-throughput measurements on composition spread library films, e.g., scanning probe electrical resistivity, Seebeck coefficient (300 K to 1000 K), and thermal effusivity. Thus, we can evaluate thousands of compositions within a relatively short measurement cycle. Recently, we have begun to develop reliable supplementary thermoelectric data in the form of phase diagrams for use by researchers to better understand structure-property relationships. 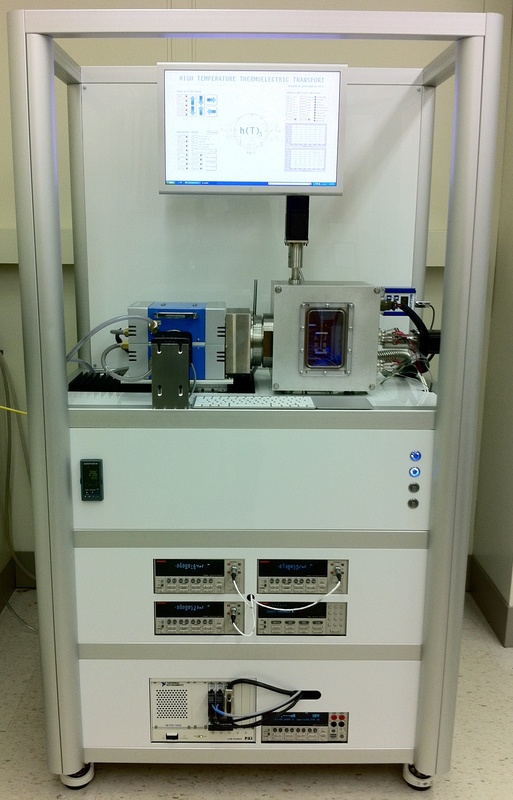 Photograph of the custom high temperature (>300 K) apparatus that measures resistivity and Seebeck coefficient on bulk TE materials. 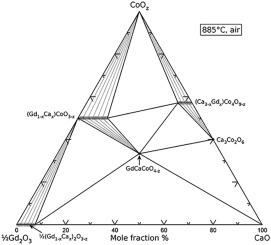 Phase diagram of the CaO-½Gd2O3-CoOx system at 885 °C in air, showing the limits of various solid solutions and the tie-line relationships. N. D. Lowhorn, W. Wong-Ng, Z.-Q. Lu, J. Martin, M. L. Green, J. E. Bonevich, E. L. Thomas, N. R. Dilley, and J. Sharp, “Development of a Seebeck Coefficient Standard Reference Material,” J. Mater. Res. 26, 1983 (2011). J. Martin, T. Tritt, C. Uher, “High Temperature Seebeck Coefficient Metrology,” J. Appl. Phys.-Focused Review 108, 121101, (2010). J. Martin, “Apparatus for the High Temperature Measurements of the Seebeck Coefficient in Thermoelectric Materials,” Review of Scientific Instruments, 83, 065101 (2012). J. Martin, Protocols for the High Temperature Measurement of the Seebeck Coefficient in Thermoelectric Materials, Meas. Sci. and Technol. 24, 085601 (2013). J. Martin, Error Modeling of Seebeck Coefficient Measurements Using Finite-Element Analysis, J. Electr. Mater. 42, 1358-1364 (2013). W. Wong-Ng, W. Laws, S.H. Lapidus, L. Ribaud, and J.A. 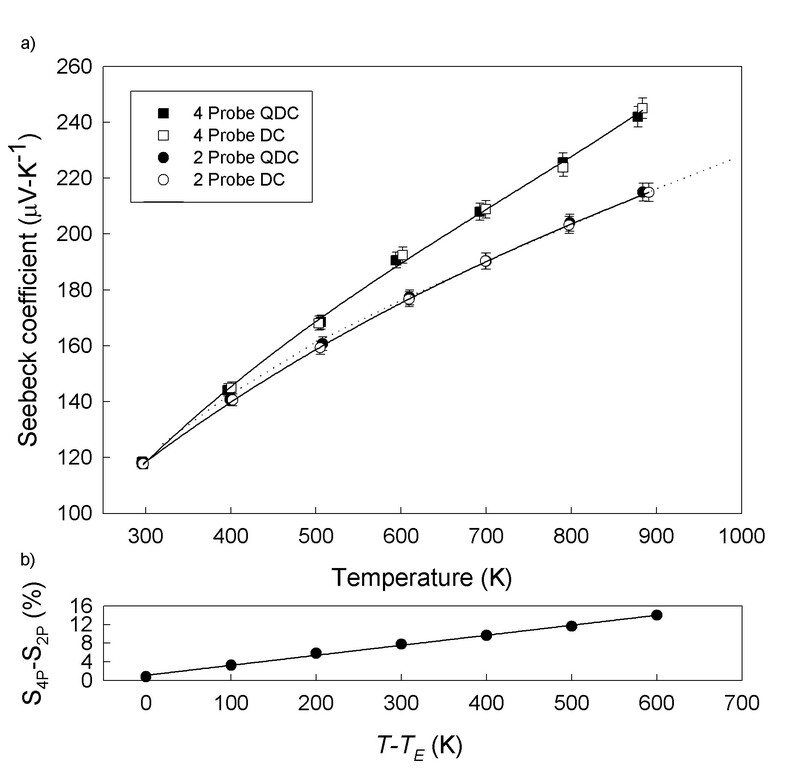 Kaduk, “Phase Equilibria and Crystal Chemistry of the CaO-½Gd2O3-CoOz System at 885 °C in Air,” Solid State Sci. 72, 47-54 (2017). Thermoelectric SRMs and validated measurement methods will allow for interlaboratory validation of data, thereby accelerating the selection and optimization of thermoelectric materials for rapid commercialization. To provide the thermoelectric materials community the means to calibrate Seebeck coefficient measurement equipment for bulk materials (an essential indicator of the conversion efficiency and the most widely measured property specific to these materials), NIST certified and released for purchase in late 2011 SRM® 3451, “Low Temperature Seebeck Coefficient Standard (10 K to 390 K)”. Seebeck coefficient measurements are generally divided into the low (< 300 K) or the mid to high (> 300 K) temperature regime, due to different practical requirements in both instrumentation and sample contact methodology. SRM 3451 has been well received by the TE community throughout industry, national and federal research laboratories, and Universities, both domestic and foreign. Following on the success of SRM 3451, we are currently developing a complementary high temperature Seebeck coefficient SRM for the temperature regime (300 K to 900 K), the mid-temperature range most relevant to waste heat recovery and its conversion via thermoelectricity into electric power. 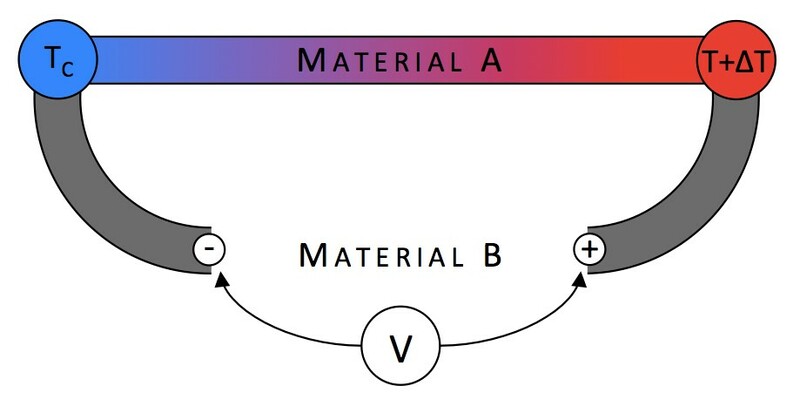 The Seebeck effect is the direct conversion of a temperature gradient, maintained between the two interfaces formed of two dissimilar conductors A and B, into an electric potential. The Seebeck coefficient is the constant of proportionality. 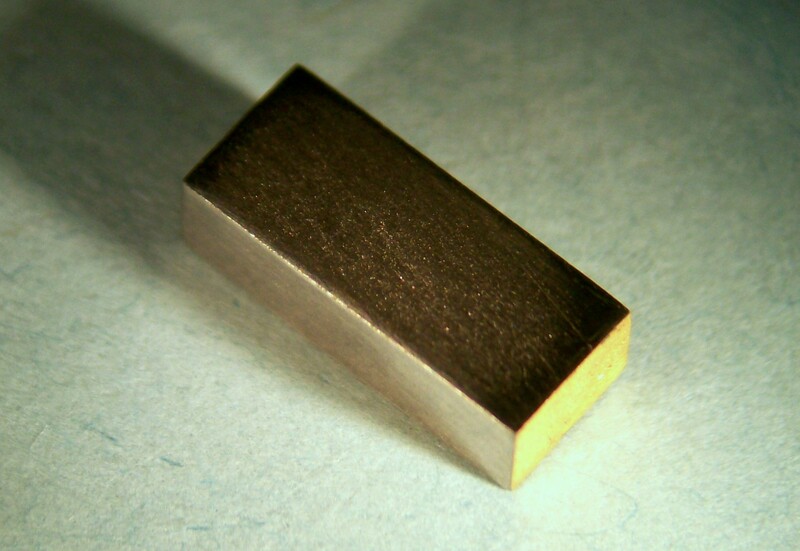 Photograph of the Bi2Te3 SRM3451 artifact for Seebeck coefficient at low temperature. Our project provides recommended practices to both mitigate and quantify sources of error that were previously ignored by researchers. We have released the design innovations and technical details of our custom instrumentation through publication[4-7]. To identify optimal measurement practices and protocols, we have designed and constructed an experimentally flexible high temperature thermoelectric measurement apparatus uniquely capable of in situ comparison of different contact geometries and measurement techniques that are commonly employed in both commercially available and custom developed instrumentation. We have demonstrated that the probe arrangement is the crucial influence on measurement accuracy, especially at high temperature where the thermal errors inherent in measuring temperature by surface contact are exacerbated. Using our custom instrumentation and expertise, we have completed a comprehensive experimental study establishing recommended measurement practices and protocols, enabling the development of a thermal contact error model to guide researchers in designing improved instrumentation and in developing comprehensive uncertainty limits. Further, to identify errors that are not experimentally accessible, we developed a novel approach to simulate and model Seebeck coefficient measurements for the first time, using finite element analysis . These protocol studies complement our comprehensive analysis of 200 years of thermoelectric measurement literature, which created a resource for best measurement practices in the form of a widely accessible review paper . Material systems we have provided measurement data for include: chalcogenides, clathrates, skutterudites, oxides, antimonides, SiGe, half heuslers, stannites, nanocomposites, and flexible polymer films. temperature increases. (b) The divergence value is a linear function of the temperature difference between the sample and the external environment. SRM® 3451, “Low Temperature Seebeck Coefficient Standard (10 K to 390 K)"
Customers for thermoelectric materials and devices are the automotive and consumer products industries, the military, NASA, and the energy sector, and include active contacts with II-VI Marlow, Teledyne, Alphabet Energy, General Motors, JPL, NREL, and ORNL. We currently collaborate with a number of Universities and research groups. Please contact us directly for more information. Dr. Joshua Martin, the project lead, is leading the international VAMAS Technical Working Area 38: Thermoelectric Materials, organizing the effort to identify and disseminate measurement protocols and reference materials among participating NMIs. We have also represented NIST in the International Energy Agency Thermoelectric international round robin, and in the Interagency Advanced Power Group’s (IAPG) Renewable Energy Conversion Working Group.